Movies look easier than writing because they have lots of pictures instead of lots of words. You could change your sandwich story into a movie. If writing is hard for you, you could start by making a movie first. Draw some pictures to show something that happened to you. After you draw the pictures, add just a few words. Too easy? Add some dialogue. What did people say? What did you think to yourself? When you are ready you can change the whole movie over from a series of pictures to a galaxy of words! Remember our constellations? You really can be a movie star! 1 Look at your sandwich story. 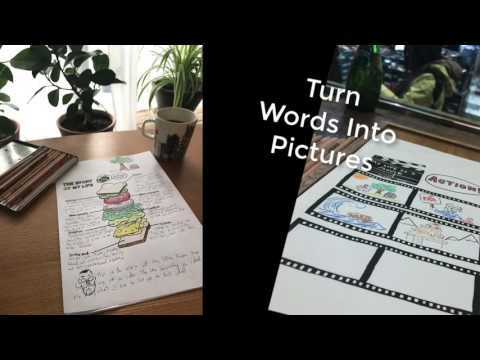 2 Draw a picture in each frame instead of writing things down. 3 You might want to include dialogue. 4 When you are ready put your movie into words. Write a story. Sometimes it is really, really hard to write. If we start with pictures, it can be easier. Once we have a picture it gets easier, the idea is already there. We know what to say, we just have to describe the picture.